In the Zohar (155 B), the Hebrew Book of Splendour, it is said that God sent Archangel Ratziel, (who reigns in the mysteries of the highest wisdom, Chokmah,) a book to give to Adam. This book was about the holy mysteries of the highest nature, the Holy wisdom of the 72 kinds of knowledge, virtue and power. 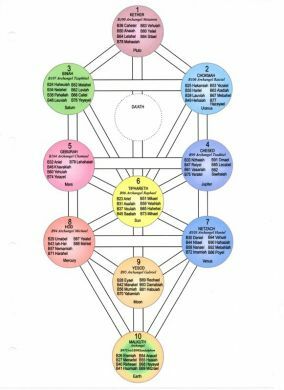 In the Kabbalistic Tree of Life, these virtues were structured in nine groups ofeight Angels, which are ruled over by its own Archangel. In the Aura-Soma Colour System we have our own interpretation of this. The Aura-Soma Colour System Angel bottles support in the process of development and help to gain greater access to our own potential, that we may fulfil our unique purpose of incarnation. The old Kabbalists offer us the possibility to look at three guardians related to the birth day and birth time, which can help to reveal the conditioning and potential we brought with us from former lives. To Know Thyself, we have to remember that we are beings composed of a physical, emotional,intellectual and spiritual body. Only their sacred harmonious interplay offers our wellbeing. So the Divine in our spiritual is expressed in each of the other three, in our body, feeling and mind. In many ancient traditions the symbol of a dot in a circle stands for the mystical and the divine and its creation. The circle of the 72 Angels can be seen as an echo of this Divine form. The chorus of the Angels is the potential for evolution which forms the circle. This is a symbol of God’s first impulse of creation which manifests itself as true sound and colour (the word and the light). The dot in the centre of the circle can be seen as a tiny crystal that holds in its centre another circle and so on in infinite regression. This is reflected in the make-up of our Light Body, or that of a galaxy or nebula. The chorus of the Angels opens us for a deeper knowledge of our crystalline structure, our true sound and colour. The science of the Kabbalah reveals this substance of the Divine as 72 nameable qualities. This God code is called the ShemHamphorash, the holy body of the creator, *made up of 72 divine qualities which the names of the 72 Angels represent.. We understand the sacred 72 Angels as alchemical agents of change who are able to alter the way we are aff ected by our life. We look at them as an expression of our divine blueprint.. We are all made up of God substance, no matter who we are and where we come from and the purifying vibration of the Angels forms our Light Body, our most potent communication vehicle with the divine. Perhaps not coincidently man has discovered their energy imprint in the 72 degrees rotation of the cube in our DNA. It is forming the shape of the Icosidodecahedron which calls to the human heart to build on the perfection of our crystalline structure. *God made man/woman in his/her own image. Aura-Soma recognises the 72 Angels as keys to heaven, spreading peace, insight and bliss. The Angels are the force of the divine luminous material fed into the earthly material to bring movement into the creation. So they are here within us, we only need to make them conscious, to open the heart to recognise, receive and invite them towards us.